Dr. Champagne has been studying the art and science of cosmetic dentistry for nearly 30 years. Following his one-year dental implant training at NYU, he became focused on applying his cosmetic dentistry skills to dental implant restorations. His quest to provide his patients with dental implants that were not only functional, but beautiful as well, led him to develop New Jersey’s Award-Winning Dental Implant Team. Cosmetic dental implants require a dedicated team approach. Using our state of the art equipment and our in-house laboratory, our laboratory technician artists work side-by-side with our patients to create the smile of their dreams that are computer perfect. 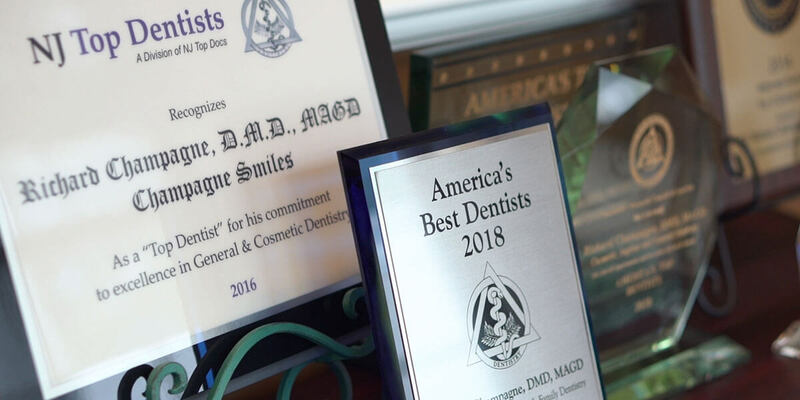 Our award-winning NJ dental implant team includes surgeons, restorative dentists, and laboratory technicians who work together to create outstanding results. Only dental implant team voted BEST for the last 5 years! Only sedation dentist voted BEST for the last 5 years!